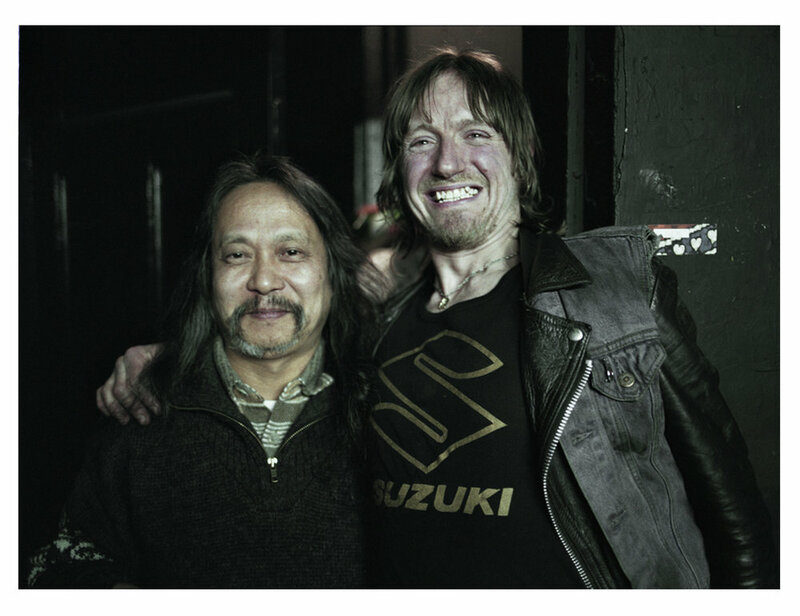 For approximately seven years I was Road Manager, Guest House, Venue D.J., Bus Driver and Gig Producer for Damo Suzuki. These were skills I never consciously pursued but experiences I certainly welcomed. Also necessary if you were looking to spend quality time with the ever moving Damo. Below are the artworks for the Cleopatra Records release created by their designers. So much has happened in the years between but the tragic loss of the extremely talented Viola player Vince Sipprell makes everything pale in comparison. Vince is top far right in the picture above. Vince you will be forever missed. Arriving at the venue that morning. Jono Podmore aka 'Kumo' kindly did some edits of the performance. The piece above is from the First Act of the performance, which is not part of the Cleopatra Records release. Which brings me to an Interview I conducted with Damo in 2010. The primary focus being on his use of 'language'. G. This is called Round Mattress this Interview. D. No it’s not Round Mattress this interview..
G. Well what is it..Ballbearing? D. No it’s something Pharmacy. G. Pharmacy? Oh oh School school what was it? G. Damo when you made a conscious decision to sing in your own language how did you formulate that? What was the idea? D. If you have a particular texture and a special language people isn’t listening so much music but texture so it isn’t interesting if you are creating person and you think of music just the other way. 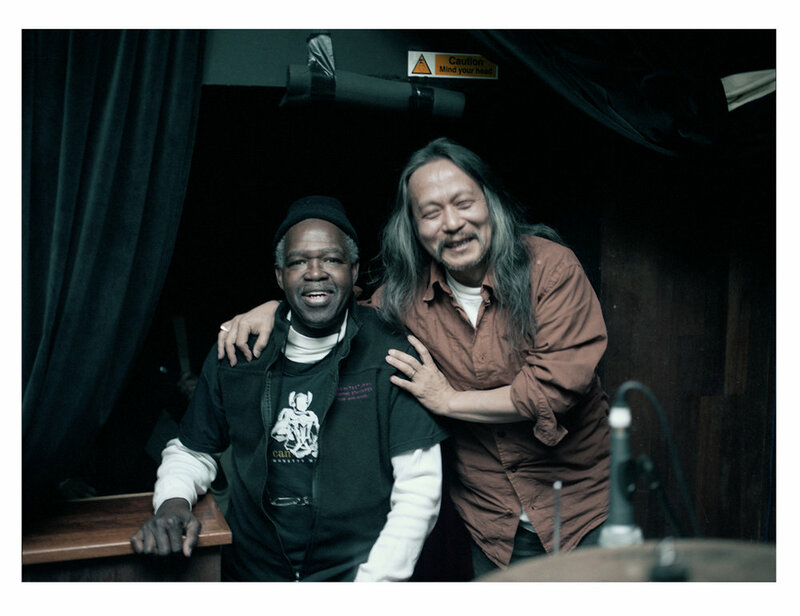 It is another music instrument and also everybody in the audience can make their own stories, it’s totally interactive. It’s the best way. Everybody have a special experience. G. Was living in Germany and being a foreigner also a reason to not sing in German or English? D. No it’s not so important. G. Is singing in this language causing an energy rise within yourself? Is that the motivation? D. The motivation is to sing in a language that nobody understands and still we can communicate because music is a communication so it doesn’t matter which language you can just use your voice as a musical instrument and they can feel it much more because the words we using everyday which is just made up after the human beings came. Before human beings it was much more spiritual maybe. They talk more from the inside..because they didn’t have any words to understand. So this point is quite interesting because people do not realise that this communication is meant..but still they try to communicate and music is like this. G. So these words that are coming from inside you..they’re emotions. D. Yes. Another hand is if you have this music this so called Instant Music..If you have a texture there is written already not only texture because every word has written kind of reasons and you are already fixed with reasons before you make instant music. So it’s not that much interesting like a..you play in a venue..if you play in a theatre, play outside, everywhere has a different shutter and the good thing about this music is you can make a soundcheck and you can feel about the room and you don’t have to play everytime the same tempo like you used to do. So it’s much more communicated with the room that means it’s much more I think with nature. G. Living in the moment? D. Yes so..nature is living in the moment. G. So will you aways want to do this? Will you go on performing forever or will you stop? D. Actually everybody should find their own missions and this is my mission to create time and space of the moment because it’s much more communicated with the people and also this is the best way for me because it fits together with my character and uh I just like to live together with the moment and nature, I don’t like to have any kind of stress. So I just don’t like to try to be anybody else and I just don’t like to be like that. It’s my life you know so I must find my rhythm myself which is good with me. If you are good with yourself you can share this energy with other people too but if you are imprisoned you cannot so it’s a thought of energy. G. Would you describe your music as close to musical anarchy as you can possibly formulate? D. Yes before I was describing it like this but now I think that description is quite boring because Anarchy is also political you know and I’m not so much interested in any kind or form of politics. It sits better if everybody gets to know themselves and find their own stuff and we can live in a harmonised world..I think it’s best way. If everybody is individual..but individual without being egoist you know. Individual is a creative person..something he finds within himself and he finds one day this is mission! G. You’re in your 60th year and you plan to go to Japan for three months. Can you tell me what you’re hoping to experience in this time? D. It’s kind of a feeling like a longing... I think it’s important everybody does this stuff, you go back to an atomsphere. You cannot find the same atomsphere but you go back to where you’ve grown up and you go when you’re healthy and I think it’s really good because you are missing many things and time has been changing so things are another way so..it’s really about special things because I don’t have a home so you go back to home and it’s home but it’s not existing anymore..so it’s like you are coming back to your place and has something to do with nostalgia and maybe it’s not reality. D. Yes that’s why you’re coming back home. G. You’re going to travel the whole country aren’t you? D. Yes for me home is not the geography form so while I’m travelling the music also it’s kind of my home. I think home is where you can feel very comfortable. Physically and spiritual things..so it don’t matter you don’t have to have geographically fixed place. G. Have you found in your travels somewhere that feels more like home than Japan perhaps..somewhere that is a spiritual home? D. For me if I have experience today then today is better than yesterday always so I don’t have to think about particularly one place is special or something. So everyday I think is really special and everything to learn. So that means home is everywhere.